Use the form below to inquire about Resort Near Attukad Waterfall . Use the form below to reserve for Resort Near Attukad Waterfall . Ceiling Fan, Hot and Cold Running Water, In-room Refrigerator, Intercom, Laundry Service, Private Balcony/Verandah, Room Service, Tea/Coffee Maker, TV with cable connection in each rooms. Ceiling Fan, Hot and Cold Running Water, In-room Refrigerator, Intercom, Private Balcony/Verandah, Room Service, Tea/Coffee Maker, TV with cable connection in each rooms. This enchanting Resort near Attukad Waterfall is perched atop a hill in Munnar overlooking the gorgeous waterfall. The roads leading to this spectacular Resort near Attukad Waterfall twirl with hairpin bends and are strikingly steep, taking you as close to the sky and clouds as possible. 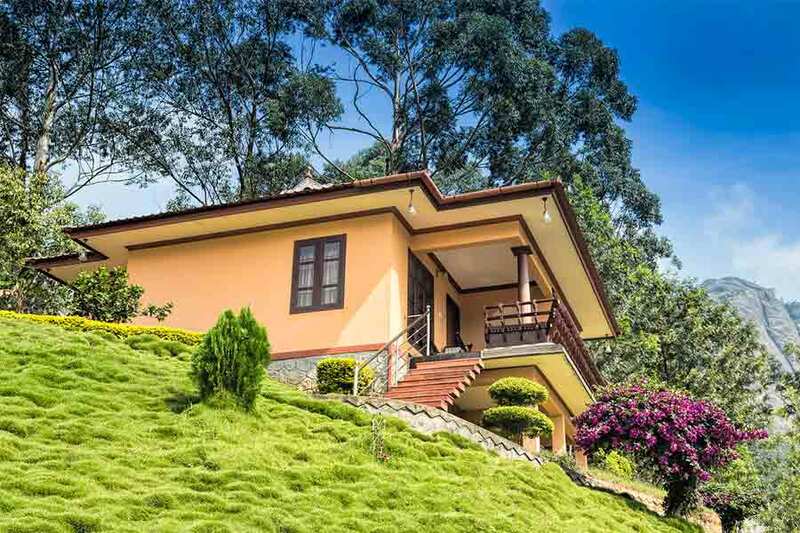 Providing stunning views of neatly lined tea plantations, tall eucalyptus trees, verdant meadows, lofty mountains, and valleys with streams flowing it offers world class accommodation with heart-warming hospitality. Misty sun rays peeking through the eucalyptus plantations create an aura of fairytale proportions here. Having received recognition from various tourism bodies for excellence in the hospitality sector, this resort is the perfect place to make some memories. Everywhere in this resort, you can catch a glimpse of the majestic mountain ranges stretching up to the blue sky, symbolizing peace and tranquillity. This slice of heaven provides a great romantic nook for couples. The air is rich with rustic charm and purity that makes lasting memories. The exterior design of this Resort near Attukad Waterfall is an example of authentic Kerala architecture and emphasis is on eco-friendliness. Four cottages, two homestays, and many luxury rooms are on offer to choose from. The super deluxe cottage being the most sought after accommodation enjoys panoramic views of the stunning Attukad waterfall, manicured lawn, flower-studded garden, valleys, and meadows with many shades of greens and the far away mountains. The Deluxe accommodation lets you soak in the valley views and lose yourself in the sights and sound of the frothing waterfall. The altitude of the rooms in the three-storey building at the top of the property helps create a feeling that you are floating above the striking valley. The rooms in the resort are scattered afar, offering privacy. Each room is crafted with comfort, luxury, and is best-in-its-class for privacy and safety. All modern creature comforts and luxuries are stacked up in each accommodation. Some of the cottages are appointed with coffee makers and refrigerators. The restaurant serves up sumptuous continental, Chinese, and Indian dishes and some exclusive beverages. The first-floor location of the restaurant and the magnificent glass panel windows let you dine with the gorgeous scenery for company. Fruits and vegetables used are from the gardens around the cottages. Spices and coffee too are freshly sourced in-house. Tourist guides, guides for trekking, assistance for sightseeing tours, bike rentals, and jeep safaris to the world’s highest tea plantations can be arranged on request. If you wish to up the rustic and romantic quotient, a campfire can also be arranged. Extra person (above 6 years) will be charged. Check-in time is 12.00 noon and check-out is 11.00 am. Rates are subject to periodic revision. The booking confirmation will be made after payment of 75% of the total amount. The receipt must be produced at the time of check-in. Full amount refund (fewer bank charges) if canceled before one month of arrival. 50% refund if canceled between one month to 15 days of arrival. 25% refund if canceled between 15 days to 7 days of arrival. No refund shall be made if canceled within 7 days of arrival. The best of the experiences at Munnar and this mesmerising resort can only be witnessed in person more than words or images. The beauty of the moment when the sun’s rays knock on your glass windows to wake you and the sight of the rays peeking through the mist amidst the sights and sounds of Attukad waterfall gushing through tea and eucalyptus plantations is inexplicable. One can sit back and enjoy these marvels of nature for days together. A guided nature walk through spice and tea plantations is a rejuvenating journey. As you stroll through the lush terrain, flocks of colourful birds force you to pause and be lost in their charm. Go for a yoga session to strike a balance with your inner self. The sauna is a soothing experience that should not be missed. Barbeque and bonfire evenings at the resort can be enchanting. It’s just what you need to add a little zing to the bonding time here with your loved ones. Rent a bike and blaze your own trail through the rugged terrain of Munnar and be an adventurous traveller, unleashing the adrenaline rush. Visiting Kollukkamalai which is the highest tea garden in India can be done in a jeep safari, organized by the resort. Trekking and sightseeing assistance for exploring other popular attractions of Munnar can also be arranged. Witness wildlife, soak in the scenery, picnic in the meadows, trek to the peaks or dare try your hand at rock climb or rappelling. Close encounters with wild animals at Eravikulam National Park and Chinnar Wildlife Sanctuary will leave you thrilled. The endangered Nilgiri Tahr is preserved at the National Park. The tea museum at Munnar will open your eyes to the production processes involved in making this beverage. Mattuppetti Dam’s reservoir is a surreal water body with a lake nearby that lets you experience placid pedal boating as well as thrilling speed boating. Top Station is the highest peak of Munnar from where 360° panoramic views of Kerala and Tamil Nadu border can be relished. Lakkom Waterfall, Briar Bridge, Rajamala, and Marayoor sandalwood forest are other popular destinations near Munnar. Kochi is the nearest airport to Munnar. From Kochi, Attukad Waterfall is 130 km (appx 3.5 hrs). From Kochi, head towards Muvattupuzha by driving on NH 83. Continue on NH 83 towards Kothamangalam. After crossing Neriyamangalam town on NH83, you will come across the thundering Cheeyappara waterfall. Crossing the falls, head east on the same road to reach Munnar. You will be crossing prominent places like Adimali and Kallar Vattiyar before reaching Munnar. After the Tata Tea outlet on NH83 at Munnar, take the diversion to the right. This road leads to Attukad Waterfall.